I would love to tell you that I clean on a daily basis, but that would be a flat out lie. I try to clean on a daily basis but that doesn’t always pan out how I would like. As I’d once read on the internet, cleaning with children around is like brushing your teeth with a mouthful of Oreo cookies. But that’s not for lack of trying. 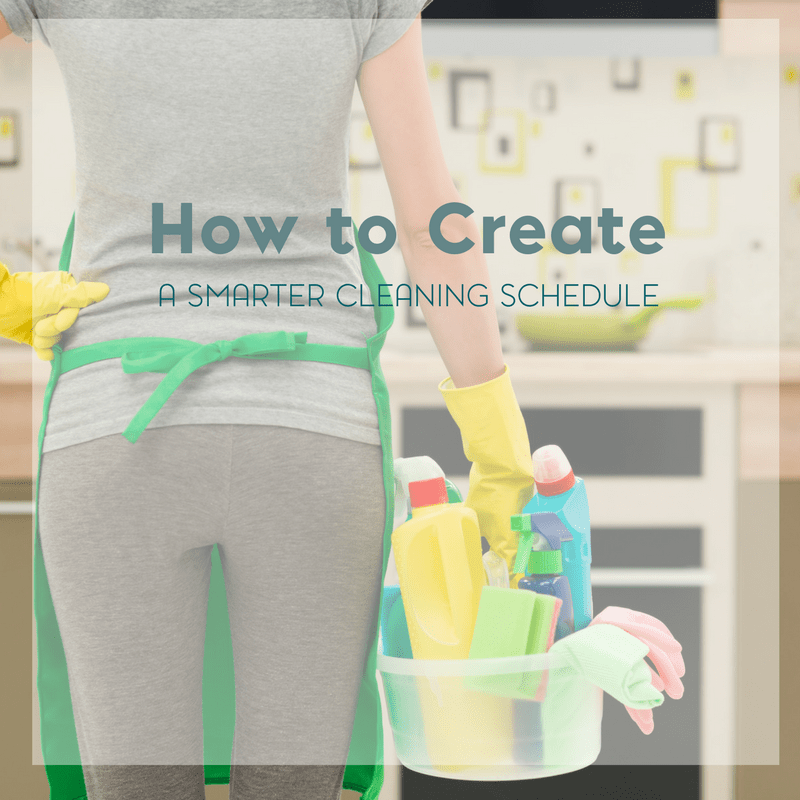 For me, it’s a matter of creating a smarter cleaning schedule. Sometimes trying to clean during the day, when she’s wide awake, makes absolutely no sense. I might get something done but I won’t get it all done. That’s all well and good but what else can I get done daily to help make the rest of my cleaning schedule more manageable? 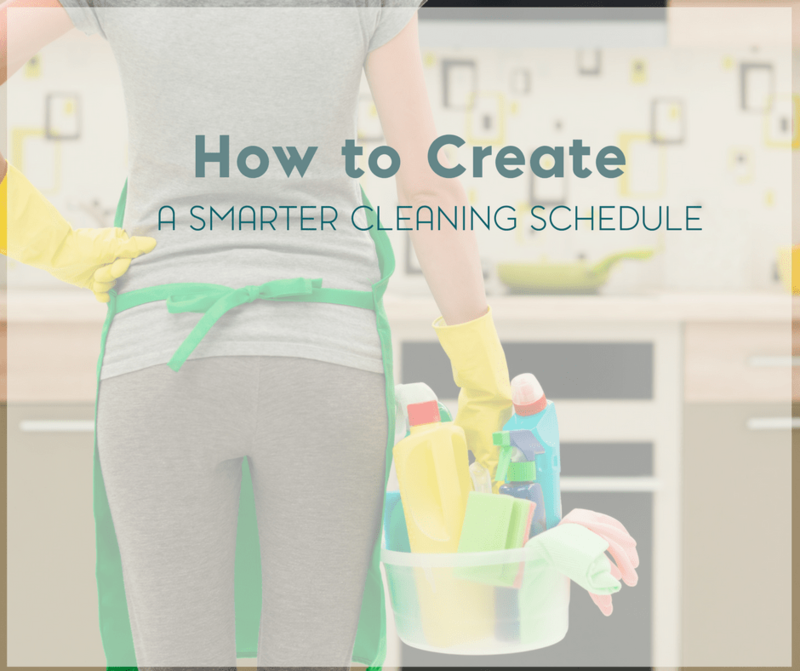 The first and biggest step, for me, in creating a smarter cleaning schedule was to simply. And I don’t necessarily mean in the terms of de-cluttering or organizing but rather to just make my cleaning schedule work for me. I stopped stressing about maintaining a picture perfect Donna Reed home. Instead, I came to terms with the fact that I’m not a perfect homemaker and that this was one area where I had to put my perfectionist tendencies aside. It was either be a perfectionist and stressed or accept it for what it was with less stress. We live in a modest two story, four bedroom home. We do have a full basement and a full attic, though neither space is being used as living space. So for my daily schedule, I divide my time by rooms and focus on the major ones: dining room, living room, kitchen, bathrooms, bedrooms. I might not clean every room every day but every day I try to find something to clean. The bedrooms, for example, beds are made and dirty clothes are put into hampers. With the bathroom, it could be something as simple as wiping down the sink or cleaning the mirror above the sink. Other tasks I’ll save for a weekly clean. Either the first or last week of the month, I’ll assign each major area one day. During that day I focus on larger cleaning tasks. This helps me keep my monthly cleaning to a minimum. I’ll also prioritize in terms of what can be left for a weekly clean, a monthly clean, or a deep clean. I’m trying to clean smarter, after all, not create more work. 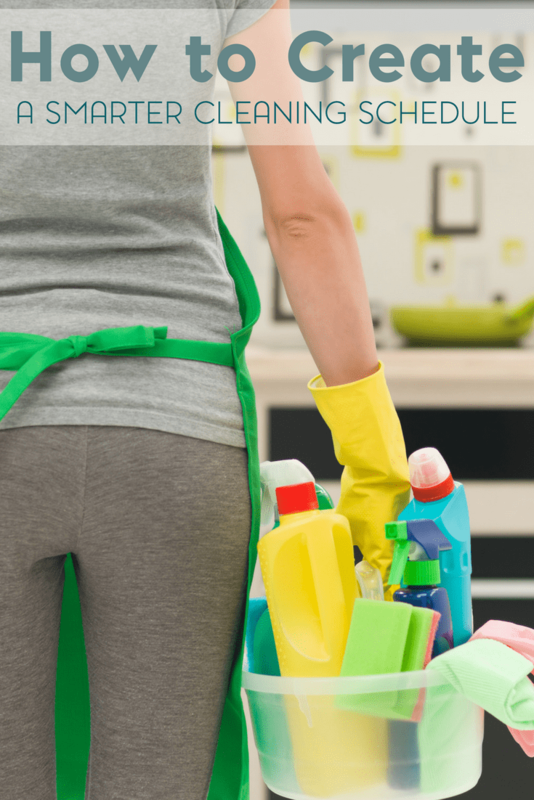 But, by putting these simple practices to work and creating a smarter cleaning schedule, I find that I’m less stressed and not spending hours cleaning every day. Breaking down my cleaning tasks and setting aside my perfectionist tendencies have helped me become more efficient with my time. No, we aren’t the Donna Reed family with every corner of the house immaculate but our house is clean. Before I get to that free printable, which will be expanded on for subscribers only to include more charts, I also wanted to share a few tips for baby wearing and cleaning. Yes, I did practice baby wearing with Squeaker and yes, I did occasionally clean while I was baby wearing. This lets her stay close to me and still allows me to get some stuff done. Please be advised that some links are affiliate links. 1- Avoid any cleaning products with bleach or overly offensive fumes. Do not expose your baby to this toxic mess. If it’s bothering you, just imagine what it’s doing to your child. I recommend Pure Care Home or Seventh Generation, if you must use cleaning products. Otherwise, try wet cleaning with a cloth and water. 2- If you’re normally a front or hip baby wearer, try back wearing your baby. You can still give your child a play by play but they aren’t right up close and personal with your cleaning supplies. For this reason, I liked a versatile baby carrier like the Ergo. 3- Try dusting, sweeping, or mopping instead while you’re baby wearing. 4- Save any tasks that involve reaching or bending for later. This puts far less strain on your shoulders and back. Washing dishes, for example, pace yourself. Or save it for later. 5- Don’t overdo it. Yes, it might be tempting to be supermom and say that you cleaned your entire house while wearing your baby but you’ll feel it later. That’s just one way to create a smarter cleaning schedule, what tips would you share? LOL when my daughter was little I’d pick up all her toys and straighten up a bit while she was taking a nap, the living room looked so nice, then it would start all over when she woke up! LOL I agree with you on cleaning on a schedule. One thing you can add is when you are in the shower, if the window is right there, you can clean it with a towel while showering. I use to do it, then we moved and I didn’t have to clean the window anymore. That is a great tip, I like that! Great advice, especially about giving up perfectionism. Another thing that works well is to just get out one or two toys at a time–a child is overwhelmed by having the entire toy collection out on the floor anyway.